LE BOURGET, France -- With the tap of a gavel and thunderous applause, 195 nations and the European Union adopted a new climate change plan, one with the ambitious goals of slowing global warming by reducing greenhouse gases and aiding poor countries adjusting to the negative impact. As president of the Conference of Parties to the U.N. Framework Convention on Climate Change, or COP21, French Foreign Minister Laurent Fabius presented delegates with the final text, and a few hours later the "Paris Agreement" was approved by consensus of all the countries involved. The product: an agreement on a plan to slow global warming. The adoption of the plan to slow global warming was announced Saturday. The takeaway was a shift from dependence on fossil fuels to clean, renewable energy, with the hope of averting dangerous climate effects. "Nobody will get 100 percent of what they want," Fabius said. "What I hope is that everyone remembers the message of the first day, when 150 heads of state and government came from all around the world to say, 'The world needs a success.'" There was little doubt that high-level arm-twisting made the deal happen, most notably a Thursday call by President Obama to China's President Xi Jinping, which followed earlier calls to Indian Prime Minister Narendra Modi and Brazilian President Dilma Rousseff. Janos Pasztor, the U.N. assistant secretary-general on climate change, told CBS News that the message of the plan is to "send a strong signal to the markets, the private sector that this is the direction we are going, to a low-carbon, low-emissions world, so investing in new technology is the way to go." "What it means is, for example," Pasztor said, "is get your act together, oil and gas industry, and develop these carbon capture storage systems." "What we want is zero emissions at some point in the future; from a climate point of view, it is perfectly OK to continue oil and gas for some time to come," Pasztor said. U.N. Secretary-General Ban Ki-moon said that 186 countries, representing close to 100 percent of global carbon emissions, had submitted their national climate plans, called the Intended Nationally Determined Contributions (INDCs). "This is quite encouraging," he said, adding that municipal and business leaders as well as civil society organizations were also at the conference to play a role. An agreement would be judged, delegates and U.N. officials say, on its ability to send a message to the markets if investors shift from fossil fuels and put it into low or zero-carbon energy sources. "I have absolute confidence in the ability of capital to move where the signal of the marketplace says 'go' after Paris," U.S. Secretary of State John Kerry said to the "Earth to Paris" summit earlier in the week. Not everyone is thrilled with the final compromise result; during the negotiations some scientists said that the final agreement is too weak and that sections that were deleted in the intense, often politically motivated negotiations, leading to an agreement that will not avert the dangerous warming of the world. Others believed it will restrict the U.S. and other developed countries too much. Crafting the mechanism to submit the reports on reducing carbon emissions proved to be difficult. India wanted a voluntary measure. Locking horns with the U.S. and European Union countries, the China delegation wanted "differentiation," what its deputy chief, Liu Zhenmin, said meant that rich countries, which does not include China or India, would make deeper emissions cuts and pay more into the fund. But in the end, delegates and civil society groups were visibly pleased that the summit ended in the approval of an agreement. "The agreement requires the world to wean itself off of fossil fuels by the middle of the century," said Alden Meyer, the director of strategy and policy of the Union of Concerned Scientists. "We have to get to net zero of greenhouse gases by 2060 or so. That can be through a combination of reducing emissions and increasing uptake of carbon dioxide by forests and agriculture by natural syncs. There is no way to meet this goal without phasing out fossil fuels over that time." "We would have liked to see a requirement that all countries revise the level of ambition in their proposed post-2020 commitments based on the science by the end of the decade," Meyer said. Included in the deal is a temperature goal to keep warming to a limit, but that, along with who would pay for damages brought on by global warming and what countries would contribute to fundraising to be raised annually, were the contentious issues, resulting in the negotiations dragging into an extra day. The final agreement reads, "the Parties to the Paris Agreement shall set a new collective quantified goal from a floor of USD 100 billion per year, taking into account the needs and priorities of developing countries." After a briefing by Fabius on Thursday evening, Ségolène Royal, the French minister of Ecology, Sustainable Development and Energy, met with reporters and told CBS News, "The financial sector should bear the responsibility of gathering the necessary funds, help countries transition to a low-carbon economy." The plan requires countries to keeping the rise in the global average temperature "well below" 2 degrees Celsius (3.6 degrees Fahrenheit) and "endeavor to limit" them even more, to 1.5 degrees Celsius by the year 2100, compared with pre-industrial levels. Emma Ruby-Sachs, acting executive director of Avaaz, a global civil action group concerned with the climate, said: "This deal will represent a turning point in history, paving the way for the shift to 100 percent clean energy that the world wants and the planet needs. By marching in the streets, calling leaders and signing petitions, people everywhere created this moment, and now people everywhere will deliver on it to secure the future of humanity." 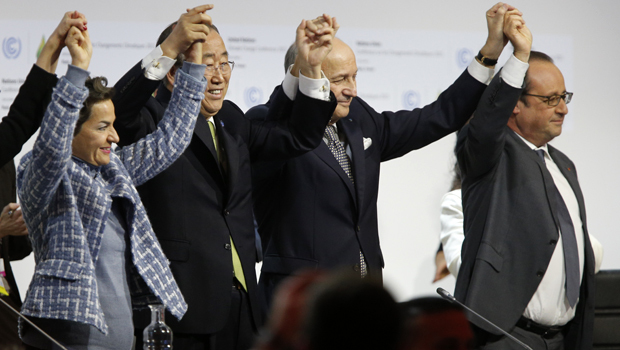 "It will be a big step forward for all of humanity," Fabius said Friday. "The agreement is a mechanism for how countries will behave - the new rules of the game," Pasztor told CBS News. "Whatever they commit to is not legally binding but they have to report ... it is not name and shame, it is name and encourage." Ban, reacting to the final agreement, said, "Nature is sending urgent signals. The solutions to climate change are on the table. They are ours for the taking."